Generally, industrial facilities are situated remotely from extensive forest areas. And since it takes considerable efforts to transport wood, it is sparingly used as a raw material in industry. Now, researchers have developed a steam drying technique that can lower the weight of wood, making it easier to transport. 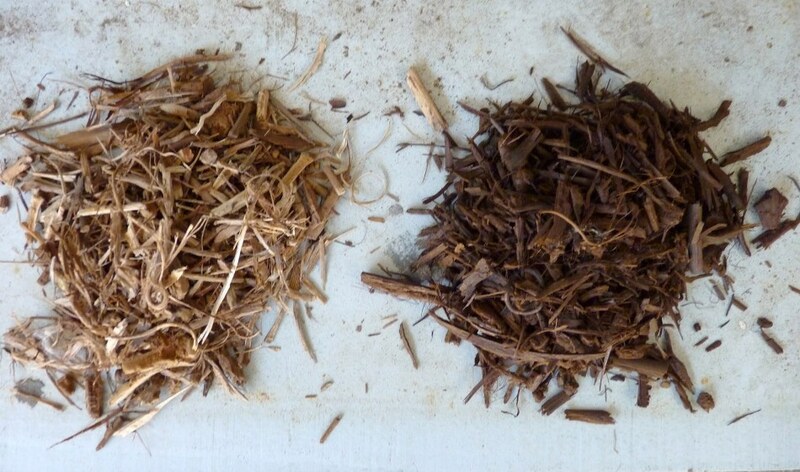 The project partner in Spain is investigating the torrefaction of various lignocellulosic substrates, including pruning (left untreated, right torrefied). Now, to change that situation, scientists from the Fraunhofer Institute for Interfacial Engineering and Biotechnology IGB have collaborated with various partners in the EU-funded SteamBio project. Together, the team has developed a unique steam drying method that could considerably reduce transportation costs and at the same time yield valuable feedstock for the chemical sector. The method is already being used at a pilot facility located in Spain. At the ACHEMA trade fair, which will be held in Frankfurt am Main from June 11 to 15, 2018, visitors will be able to view the facility’s model for themselves (Hall 9.2, Booth D66). Natural gas and crude oil can possibly be replaced by using wood on an industrial scale; this approach provides an excellent opportunity. However, the major challenge is to find out novel ways to treat biomass so that sustainable products and manufacturing processes can be achieved. Usually, weak wood, forestry waste, and other substandard wood are converted into wood chips, which are a key feedstock for the wood processing sector. These wood chips are also used as fuel in woodchip heating systems and thermal power plants. Conversely, fresh wood chips have high moisture content, which presents two challenges: it is hard to store the damp cargo, and it is a lot of weight to transport. If the material is not protected from rain, it will decay rapidly. As part of the EU-funded SteamBio project, scientists from the Fraunhofer Institute for Interfacial Engineering and Biotechnology IGB, along with 10 other project partners from four European countries, devised a novel method to adapt wood chips for storage and transportation. This considerably lowers the material’s weight, enhances its specific calorific value, and enables the researchers to easily grind the material into a highly reactive powder. The torrefied biomass is also resistant to water, and since it contains mainly carbon and hydrogen, it has considerably better combustion properties. As rain beads off the surface without penetrating the interior, the torrefied biomass can also be transported in open bulk containers. Compared to the untreated material, it is also significantly lighter which substantially cuts transportation costs. Two fingers are enough to crush the torrefied wood chips easily. These chips can either be ground into powder or compressed into pellets. The biomass powder has a greater surface area and therefore, it has greater reactivity in material applications when compared to larger chunks. It is also used in energy applications, where it is combined with coal dust and then fed into the firing system of coal-fired power plants. Furthermore, the entire coal can be replaced with biomass, whilst keeping the same combustion system. During the torrefaction process, volatile substances are generated that are quite valuable. These substances can be processed to achieve chemicals that can be used as feedstock for a host of industry products. So far, these platform chemicals have been traditionally acquired from natural gas or crude oil, and now torrefaction provides a sustainable method to produce them. What is unique about this method is that the vaporous products of torrefaction and the moisture present in the biomass are methodically retained in the process chamber and they themselves become the process medium. “In other words, we work with superheated steam,” says Scherer. The biomass becomes dry due to the extreme temperatures, resulting in organic compounds with low boiling points turning out to be volatile. Although lignin and cellulose continue to be in a solid state, the volatile substances enter into the gas phase. Using special condensers, researchers captured these gaseous substances and selectively cooled them, thereby recovering them as liquids. At project partner Heckmann Metall- und Maschinenbau GmbH, a pilot facility has been constructed, installed, and operated which functions 24 hours a day, 7 days a week. Here, Beech wood is utilized as the biomass. Later in January 2018, the facility was shifted to Spain to continue the operation, where project partners torrefy beech wood, oak and pine, and also vineyard prunings and waste obtained from the production of olive oil. Fraunhofer IGB researchers will be at the ACHEMA 2018 trade fair in Frankfurt am Main to display both the model pilot facility and dried, torrefied samples. Visitors can find them at the joint Fraunhofer booth in Hall 9.2, Booth D66.